Theoretical work involving researchers from Ganil, the University of Huelva in Spain and the Racah Institute of Physics in Israel, confirms the vibrational nature of cadmium-110, reproducing experimental observations that called this nature into question. Since the 1970s experiments have revealed the existence of non-vibrational states called "intruder" states. In 2018, IRFU is participating in a publication CUPID-0: the first array of enriched scintillating bolometers for 0νββ decay investigations which reviews a first matrix of bolometers installed in the Gran Sasso laboratory in Italy, with the objective of tracking the double beta decay without neutrino emission (0νββ) that will reveal the nature of neutrinos. Using NOEMA and the IRAM 30-m telescope, an international team of astronomers from different laboratories, including the Institut d'Astrophysique Spatiale (IAS-Université Paris-Sud/CNRS), the Laboratoire d’astrophysique de Marseille (Aix-Marseille Université/CNRS) and the Astrophysics Department of CEA-IRfu, just witnessed how the sites of the most intense star formation in the early Universe communicate with their surroundings through rapid gas exchange. During an experiment carried out at GANIL in Caen (France), an international team, led by researchers from Irfu and the University of Oslo, studied the shape of the Zirconium-98 nucleus. The shape of a nucleus corresponds to the area where its protons and neutrons can be found. Understanding it means mastering the behaviour of each proton/neutron and their arrangement related to the nuclear force. The objective was to determine the shape of the nucleus in different excited states. 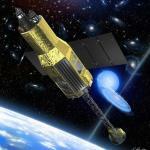 Despite a short period of activity, the japanese space agency (Jaxa) Hitomi satellite has shown its full potential by delivering relevant information’s on several celestial objects. 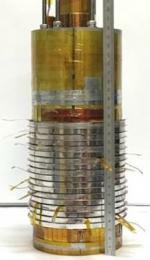 As part of the new CLAS spectrometer project for the 12 GeV electron energy upgrade of the Jefferson Lab (USA) IRFU has been conducting R&D for more than 10 years to design and build a new generation tracker, using thin and flexible MICROMEGAS detectors that are now operating with the new CLAS12 spectrometer. After one year of installation, this tracker is operational and meets the expected characteristics with more than 95% detection efficiency and a spatial resolution of less than 100μm. A prototype of the MXT camera arrived at the CNES in Toulouse on 25 October 2018. This is the Structural and Thermal Model (STM), which will be integrated into the telescope that will be sent to China to be mounted on the SVOM satellite Qualification Model. The objective of this model is to validate the thermo-mechanical design of the camera. It also makes it possible to check the manufacturing and assembly capacity of the various components, which represent more than 1,000 elements. What is the mass of neutrinos? To answer this fundamental question, the KATRIN experiment was designed and built by an international collaboration at the Karlsruhe Institute of Technology. On June 11, 2018, an international symposium marked the beginning of data acquisition. The first electron spectra from tritium decay have been analyzed with an analysis chain developed at IRFU. Everything conforms to the required specifications and the first long data taking campaign for physics can start. Using the ESA's XMM-Newton observatory, an international team, led by Marguerite Pierre of the Astrophysics Department of CEA-Irfu, has revealed the latest results of the XXL survey, the largest observation program X-ray produced to date by the XMM satellite. The second batch of data just published in a special issue of the journal Astronomy & Astrophysics, includes information on 365 galaxy clusters and 26,000 active galactic nuclei (AGN). X-ray photons were detected for the first time in late August 2018 with an engineering model of the SVOM MXT focal plane. This is an important step towards the validation of the design of the detection chain. The MXT telescope, for Microchannel X-ray Telescope, will be flown on board the SVOM satellite, a collaborative project between France (CNES) and China (CAS, CNSA) to study gamma-ray bursts. It aims at detecting soft X-rays (0. The first test campaign of the NOUGAT high field magnet was successfully carried out at the CNRS LNCMI Grenoble. This laboratory wishes to build a 30-tesla magnet by assembling a resistive magnet from LNCMI and a superconducting magnet designed by IRFU based on high temperature superconducting materials. To date, the field reached 20.8 T, including 12.8 T generated by the superconducting magnet alone. The first triplet of superconducting multipoles of the S3 Super Separator Spectrometer arrived at Ganil on August 29, 2018. S3 is one of the experiment rooms of the Spiral2 facility. The magnet, with a mass of 2.8 tonnes, is 1.8 m long and almost as high. This innovative type of magnet is very compact despite the number of optical functions it can generate (quadrupole, sextupole, octupole and dipole). It is the first of a series of seven to be delivered to the Ganil. Protons on steroids in neutron stars ? In an article published in August 2018 in the journal Nature , the CLAS collaboration of Jefferson Lab (USA) reports an extensive study on short-range correlations between nucleons in different nuclei. The conclusion goes against intuition, indicating that the greater the ratio of neutrons to protons in a nucleus, the greater the speed of protons relative to neutrons. GANIL (Grand accélérateur national d'ions lourds) is carrying out its 2018 experimental campaign from April to July. During the four months of operation, experiments in nuclear physics, atomic physics and materials science will be conducted by research teams from all around the world. Industrial users will also be welcomed at GANIL. During this period, the GANIL accelerators will operate 24 hours a day, 7 days a week. NFS (Neutrons For Science) is an experimental area of the Spiral2 facility (Ganil, France) that will provide high intensity neutron beams for energies ranging from 0.5 to 40 MeV. The neutrons will be created by collision of Spiral2 charged particles with carbon, beryllium or lithium targets, thanks to a key element of NFS, the converter. The design of this one is a real challenge because it has to withstand a high power deposited by Spiral2's intense beams. The ATLAS and CMS collaborations, involving teams from CEA/IRFU and CNRS/IN2P3, announced on 4 June 2018 at the LHCP conference the direct observation of the coupling of the quark top to the Higgs boson. Studying the interaction between the Higgs boson and the heaviest elementary particle known, the quark top, is a way of investigating the effects of new physics, which must take over from the standard model. A new project is opening today, Friday, June 15, 2018, at the LHC, the large Hadron Collider. Initiated in 2011, this project aims to bring into service by 2026 a high-luminosity LHC (HL-LHC) that will increase the number of proton-proton collisions and collect more data. France contributes significantly to this project (up to € 180 million, including payroll). An important scientific program is devoted to the three-dimensional structure of the proton in particular its elementary constituents, quarks and gluons. A new generation of experimental facilities at Jefferson Lab (US), CERN, and perhaps later on at a future electron-ion collider (EIC), should make it possible to perform proton tomography with unprecedented accuracy. The SPICA infrared space telescope has been shortlisted by the European Space Agency (ESA) to participate in the final competition which will see in September 2021 the choice of the next mission of medium size ESA (M5 mission). SPICA is a large infrared telescope (diameter 2.5 m) fully cooled to a temperature of only a few degrees above absolute zero. In ultra-relativistic heavy ion collisions at CERN's LHC accelerator, a new state of matter is formed: the quark-gluon plasma (QGP). It is a kind of very dense and hot "soup" containing only the most elementary constituents of matter. A few microseconds after the Big Bang, the Universe would have passed through this state. Because of the interactions between its constituents, the QGP flows like a fluid. Search for dark matter signals toward the Galactic Center from ten years of observations with H.E.S.S. 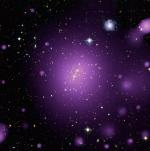 Dark matter constitutes about 85% of the total matter content of the Universe. However, its nature is still unknown. The H.E.S.S. observatory located in Namibia scrutinizes the central region of our Galaxy to search for mono-energetic gamma rays from the collision of hypothetical WIMPs, primary elementary particles that are among the leading candidates for dark matter. The search carried out with 10 years of observations of the center of our galaxy with phase 1 of H.E.S.S. A recent theoretical study of the IRFU has overturned a dark matter mechanism claiming to explain the anomaly in the neutron lifetime. Indeed, the strong constraints, extracted from this mechanism, make it impossible to theoretically predict the neutron stars of 2 solar masses whose existence is known. This study was conducted in collaboration with physicists from the University of Adelaide in Australia, and will soon be published in the journal J. Phys. G.
An international team led by researchers from the CNRS, Grenoble Alpes University and the Astrophysical Department /AIM Laboratory of CEA-Irfu suggests a radical modification on our ideas on the formation of stars. The accuracy of observations provided by the Atacama Large Millimeter Array (ALMA) in Chile has made it possible to measure the quantity of massive star-forming cores in a very active far-away region of our galaxy, and thus to show that their proportion is higher than expected. The mass distribution of the different stars formed from a collapsing gas cloud has just been successfully reproduced by two researchers from the Astrophysics Department/AIM Laboratory of CEA-Irfu. The collapse of a gas cloud of 1000 solar mass has been reconstructed thanks to numerical simulations, varying the density and the influence of turbulence. The HESS international collaboration, to which CNRS and CEA contribute, has published the results of fifteen years of gamma ray observations of the Milky Way. Its telescopes installed in Namibia have studied populations of pulsar wind nebulae and supernova remnants, as well as microquasars, never before detected in gamma rays. These studies are supplemented by precise measurements such as those of the diffuse emission at the center of our Galaxy. An international team led by the Department of Astrophysics/AIM Laboratory of CEA-Irfu has just shown for the first time that the magnetic field plays a fundamental role in the collapse of proto-stars. Based on observations from the Atacama Large Millimeter Array (ALMA) in Chile, researchers measured the polarization of dust in the B335 protostar. This polarization, emission of light in a preferred direction, results from the alignment of the dust grains under the influence of the magnetic field. The STEREO experiment presented its first physics results at the 53rd Rencontres de Moriond1. STEREO is a neutrino detector made up of six scintillation liquid cells that has been measuring, since November 2016, the electronic antineutrinos produced by the Grenoble high neutron flux reactor 10 metres from the reactor core. The existence of a fourth neutrino state, called sterile neutrino, could explain the deficit in neutrino flux detected at a short distance from nuclear reactors compared to the expected value. The T2K collaboration, whose goal is to study and measure neutrino oscillations, is publishing new results on the interaction of neutrinos with nuclei. This study, in which the T2K group of the IRFU plays a major role, is crucial in that it allows the dominant uncertainty on the oscillation parameters to be restrained. For the first time, protons emerging from the neutrino-nucleus interaction have been characterized using new variables capable of exposing and characterizing nuclear effects. An unprecedented observation of a supernova, an explosion of a massive star, was captured in its early days by an amateur astronomer, at the exact moment when the supernova became visible in the sky. 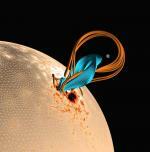 A single phenomenon could control all solar flares. This is what researchers from the Ecole Polytechnique, CNRS, CEA-Irfu and Inria have just proposed in an article in the front page of the journal Nature on February 8, 2018. They highlighted the presence of a reinforced "cage" in which a "magnetic cord" develops, an entanglement of twisted magnetic lines of force at the origin of the solar flares. 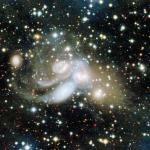 The MegaCam camera developed at CEA-Irfu has revealed previously unsuspected structures within the famous Stephan Quintet, a spectacular combination of five galaxies. The discovery of a very large red halo, consisting of old stars, centered on one of the elliptical galaxies, NGC 7317, shows that the group of galaxies is still in very strong interaction, an aspect totally ignored in previous studies. Highlighting shell effects in the quasi-fission process: an essential step for the synthesis of new super-heavy elements! During an experiment carried out at the accelerator of the Australian National University (Canberra, Australia), a French-Australian collaboration (GANIL Caen, IPN Orsay, IRFU/DPhN Saclay, ANU Canberra) first identified the fragments created in quasi-fission reactions with atomic numbers Z up to plutonium (Z=94) and mass A. For this study, near-fission reactions were induced during collisions between 48Ti projectile ions, accelerated to 276 MeV, and target atoms of 238U. After the validation of the last superconducting toroidal field coils, the CEA's contribution to the construction of the Japanese JT-60SA Tokamak, dedicated to the study of nuclear fusion, is nearing completion. Ten of them (out of twenty) were manufactured under the responsibility of the CEA by GE Power in Belfort. These coils of nearly 16 tons each will fly to Naka in mid-February to join their sisters and integrate the structure of the Japanese Tokamak. 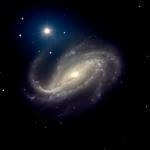 By succeeding for the first time to analyze the light of nearly 1000 very distant elliptical galaxies, more than 10 billions light-years away, a team of researchers including three astrophysicists from the Astrophysics Department of CEA-Irfu has just revealed that these galaxies of the beginning of the universe contain a lot of gas but do not form stars. 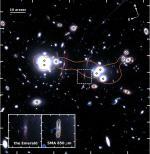 A real enigma that challenges our understanding of the evolution of these giant galaxies. Where do we come from and where are we headed? An interactive video has made it possible to reconstruct the trajectories of 1,400 galaxies, including the Milky Way, over distances reaching up to 100 million light years.